This is the true godfather of all music videos. 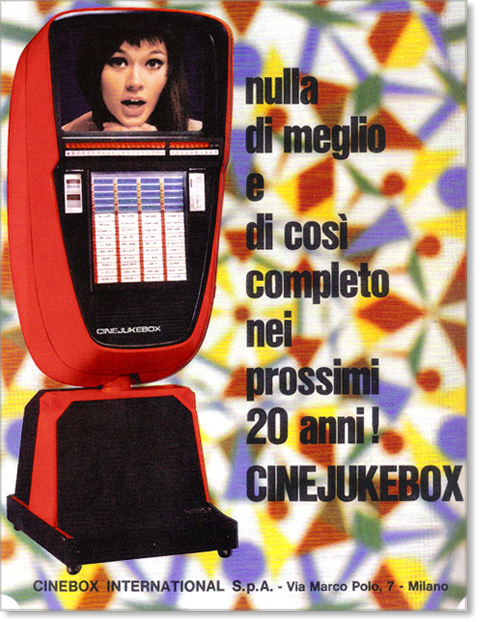 It is the first music video of short footage color film that was produced specifically to promote a song: the very first made for the public presentation of the Cinebox, that was a video juke-box built by Ottico Meccanica Italiana (Italian Optical Mechanics) in Rome. 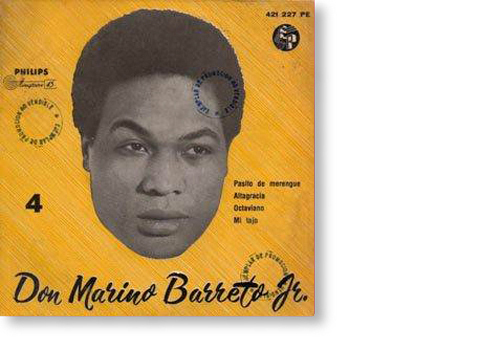 The song is entitled Altagracia, and the artist was Don Marino Barreto Junior (Matanzas 1925/Milano 1971), a Cuban singer who was very popular in Italy during the middle nineteen fifties. 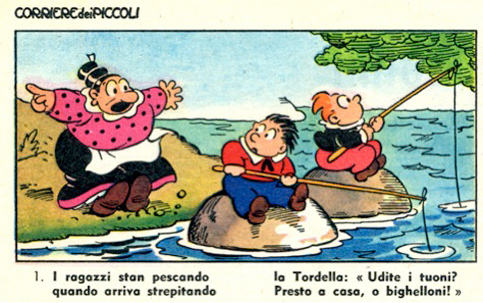 Altagracia is the name of his daughter, who we can see in the video while she is playing with puppets representing Bibì and Bibò, Captain Cocoricò, the Tordella who were cartoon characters who were loved by at least three generations of young children passionate readers of the illustrated weekly magazine called the Corriere dei piccoli. 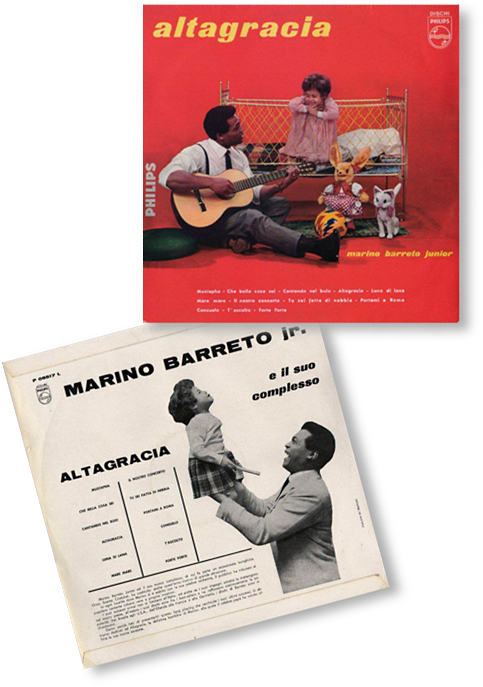 The song Altagracia, was first found on an Extended Play 45rpm’s published by Philips Records in 1958 and later inspired the title of Don Barreto Junior’s first Italian LP that was released in two distinct versions: the first came out in 1959 and the second one in 1960 which included a few selected songs from the 1960 Sanremo Italian Song Festival and they were sung by Baretto. 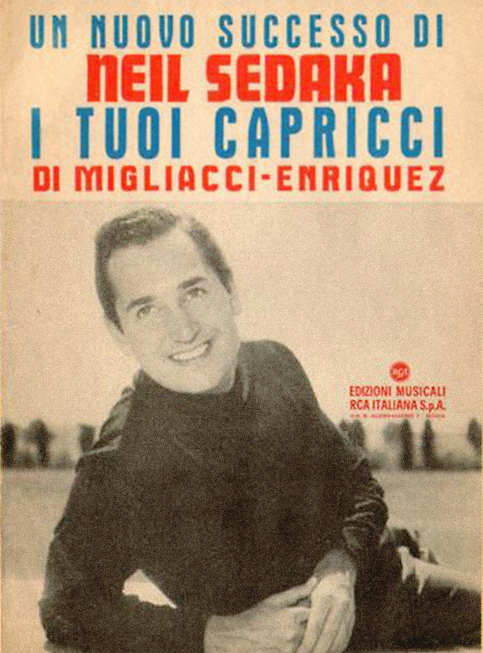 The video was filmed and assembled in November of 1958 in the studios of the Istituto Luce di Roma and was directed by Domenico Paolella (Foggia, 1915/Roma, 2002) who was the director of successful films like “Canzoni di mezzo secolo” (Half a Century of Songs) in 1952, “Canzoni, Canzoni, Canzoni” (Songs, Songs, Songs) in 1953, “Gran Varietà” (Grand Variety) in 1955, “Sanremo Canta” (Sanremo Sings) in 1956, “Non sono più guaglione” (I’m not a young kid anymore) in 1958. 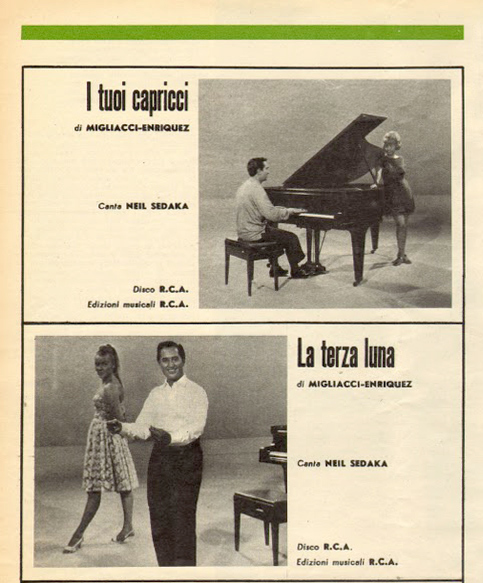 The film was developed in the Rome laboratories La Microstampa owned by Franco Iasiello. 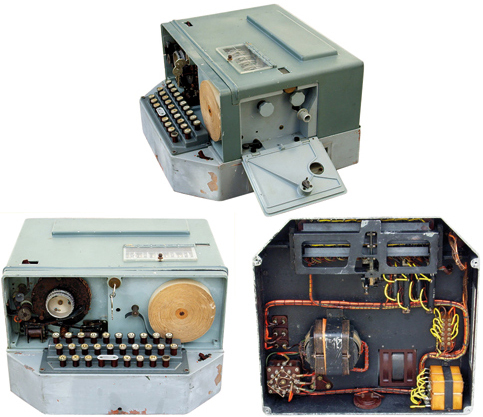 On 11th of April 1959, Circolo della Stampa Romana (The Press Club of Rome). Nilla Pizzi, was the Godmother at the official presentation to the public of the Cinebox. 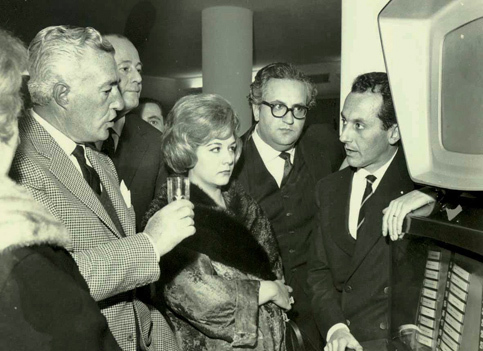 Next to her are the brothers Raffaello and Paolo Emilio Nistri, directors of the Ottico Meccanica Italiana (Italian Optical Mechanics). 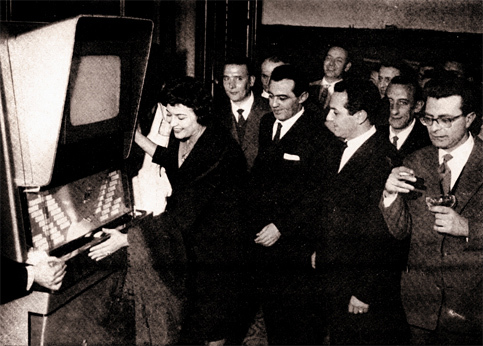 On the right (with glasses) Pietro Granelli, the inventor of the Cinebox. Granelli was born in Rome the on the 29th of June 1918. 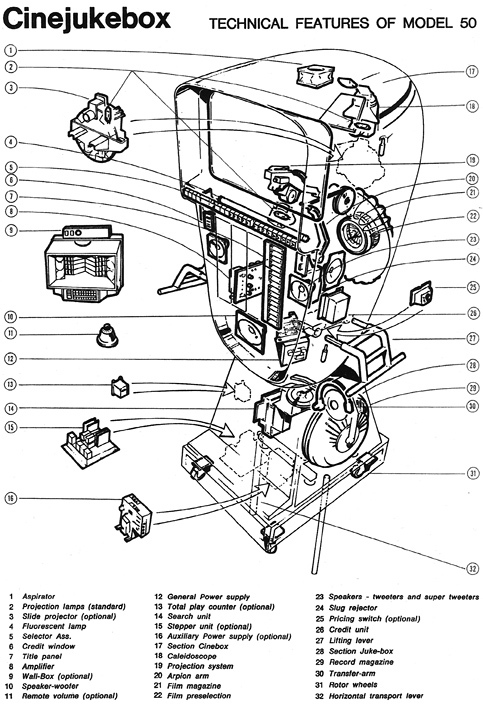 To his credentials, he has a series of inspired ideas and patents: he created a new type of illustrated sketched sequences with texts somewhat like a comic strip that told stories based upon contemporary current affairs. 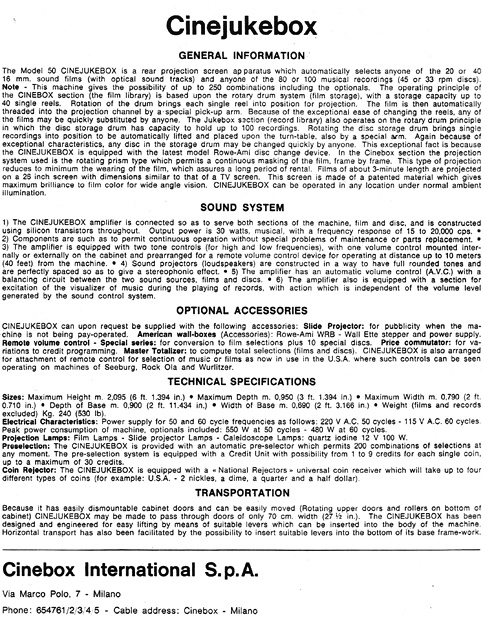 These became peek-out inserts in specialized periodicals. 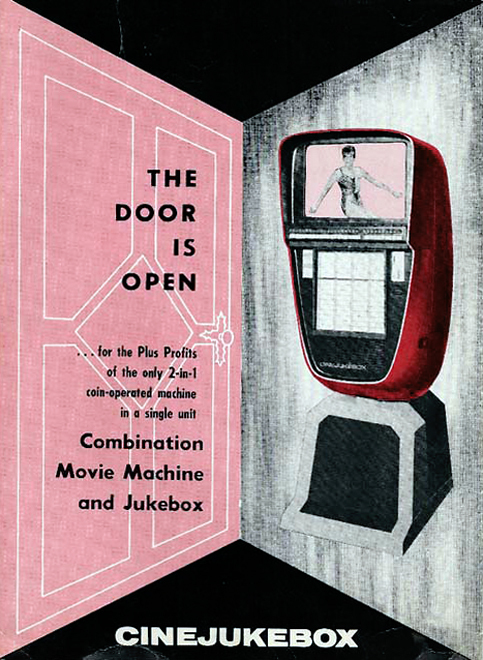 He also invented the Redi-Box, that in the edition of the 3rd of April 1960, of the weekly music magazine Sorrisi e Canzoni was described as a machine that is like a juke-box that allows you to listen to the latest hits and that actually sells and delivers a packaged record when coins were inserted into the appropriate slot on the juke-box. 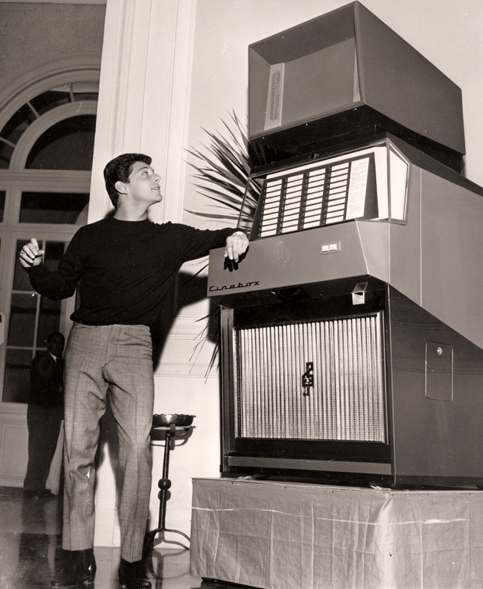 Fundamentally, he invented the Self Service Juke-Box. Pietro Granelli died in an automobile accident in the vicinity of Piacenza, Italy in 1975. 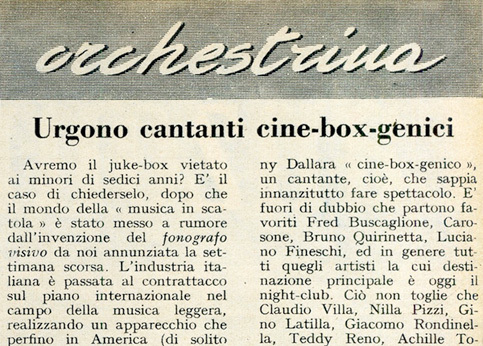 Renato Carosone with his sextet “’O Mafiuso” (The Mafia man) (Cinebox, 1958). 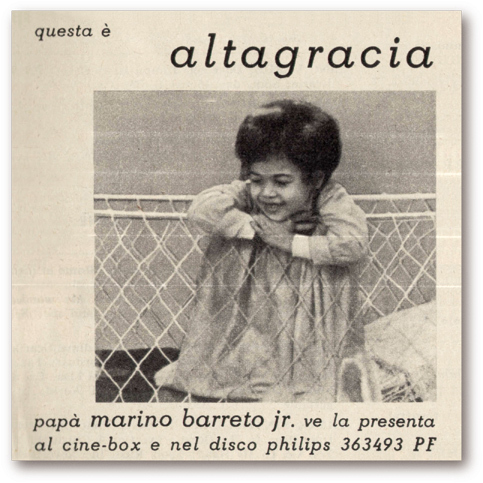 “’O Mafiuso” was one of the three music videos (the other two were “Atene” and “Torero”) that Carosone made for the Cinebox in December of 1958, just before he withdrew from the music scene on the 7th of September in 1960. 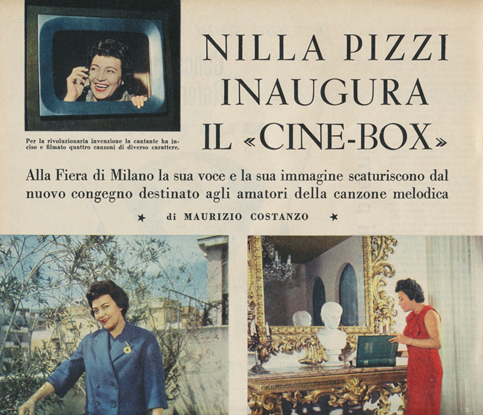 The films appeared on the prototype of the Cinebox that was inaugurated at the Press Club in Rome, Italy and at the exposition stands of the SIF company (The International Company of Audiovisuals) at the fair in Milan, Italy respectively April and May of 1959. The obligatory preceding official censure announcement by the Board of Censors of the Ministry of Tourism and Entertainment was a huge hindrance to the development of the Cinebox enterprise. 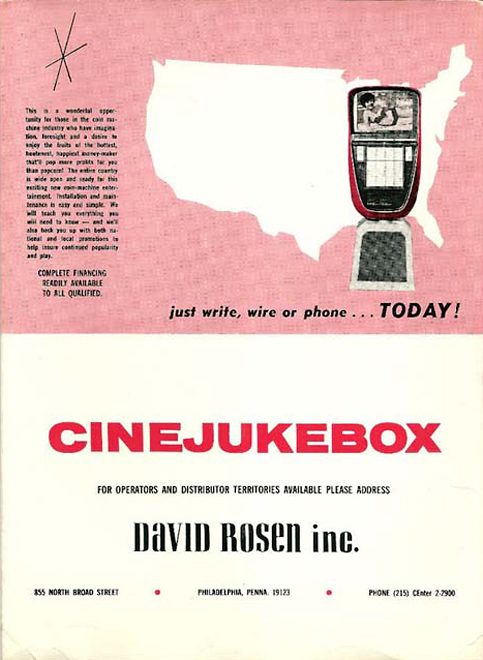 Censorship was the main culprit that delayed the commercialization of the Cinebox. 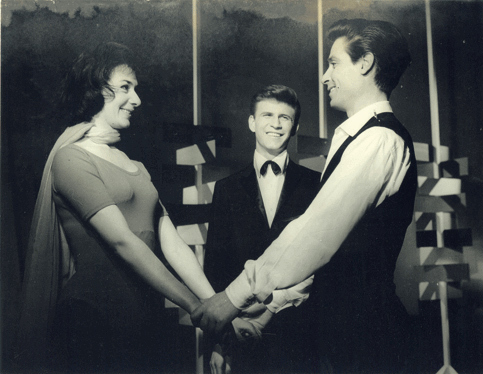 The first No objections certifications, became effective only on the 15th of March 1961. 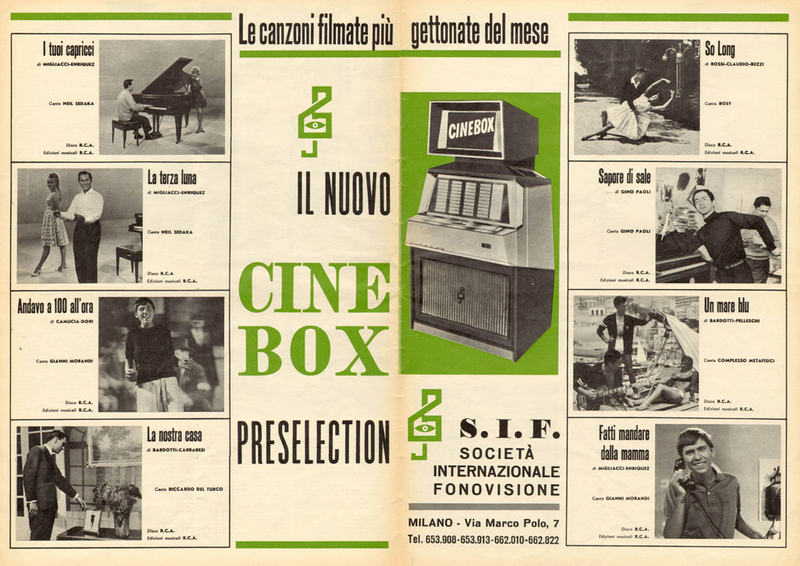 In other words, when the Cinebox was finally allowed to go onto the market, the music video entitled “’O Mafiuso” (The Mafia man) was already three years old and the singer, Renato Carosone had already retired from the music business six months earlier. Paolo Emilio Nistri, the managing director of the Ottica Meccanica Italiana (Italian Optical Mechanics) in Rome, recalls that his good friend Renato Carosone had stated that he would like to enter into a partnership of the OMI company. 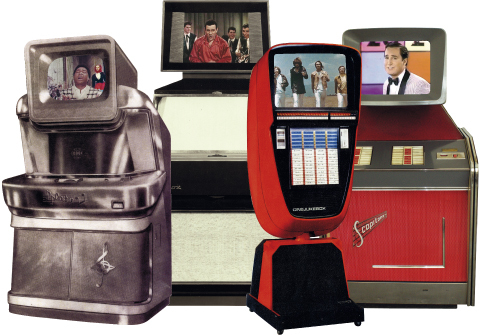 “BOHEMIAN RHAPSODY” BY QUEEN IS NOT THE FIRST MUSIC VIDEO IN RECENT HISTORY AS WE HAVE BEEN MADE TO BELIEVE. 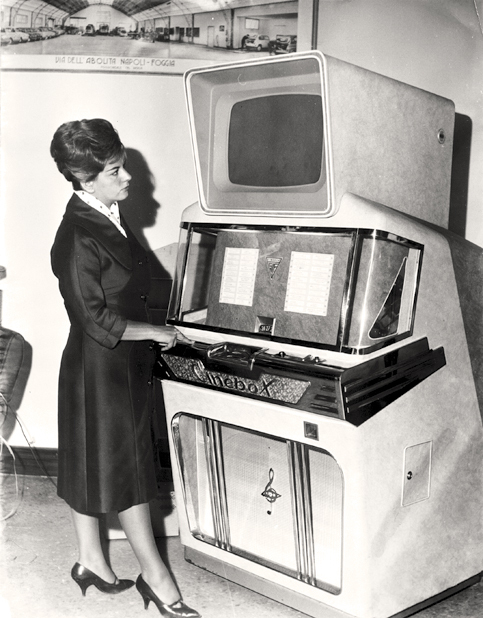 THE VERY FIRST SHORT FOOTAGE FILM CONCEIVED TO PROMOTE SONGS WAS PRODUCED IN ITALY IN 1959 FOR THE CINEBOX WHICH WAS A REVOLUTIONARY OVERSIZED ‘VIDEO-JUKE-BOX’, THAT FOR THE FIRST TIME ALLOWED US TO LISTEN TO AND TO ACTUALLY SEE THE SINGERS OF THE SONGS. 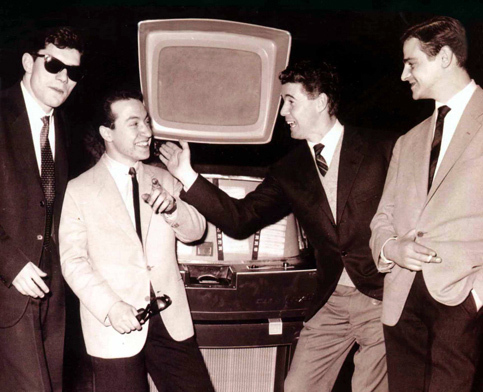 Renato Carosone, Don Marino Barreto Junior, Peppino Di Capri and Nilla Pizzi, paved the way to the music videos of the nineteen sixties that subsequently aroused the interest and opened the doors to Italian film directors like Vito Molinari, and Enzo Trapani and up and coming new-comers such as Claude Lelouch, Francis Ford Coppola and Robert Altman. 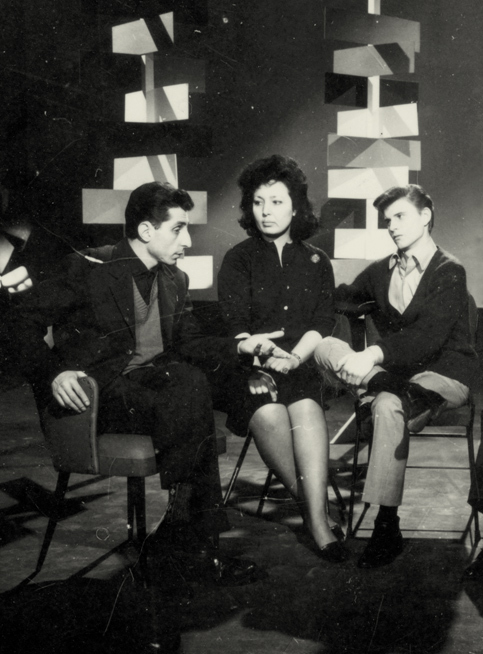 For the first time the story is narrated in the Italian Television Documentary ‘Tg2 Dossier’ that follows the thread of the new-born concept of music videos that intertwined through a background of commercial rivalry that flared up between Italy, France and the United States, and which subsequently aroused the interests of the mafia in New York and the suppression by the forceful crackdown of Robert Kennedy’s G-Men. 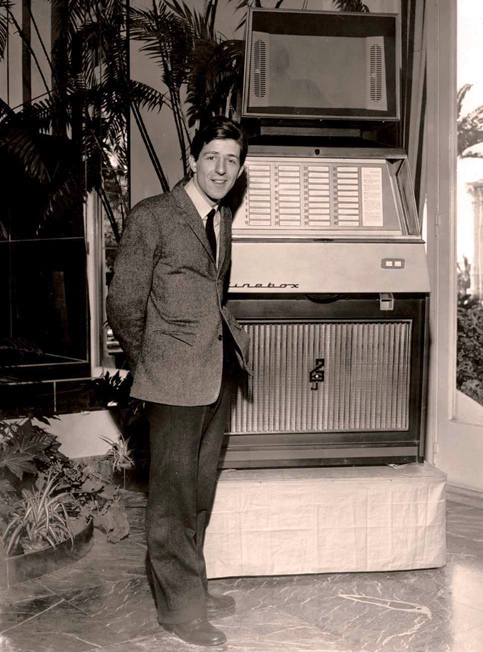 Giorgio Gaber testimonial of the Cinebox at the Sanremo Festival 1964.